Planning a wedding can be a challenging task. On Sunday January 4th, 2009 let us help you plan your ‘big day’. Wedding Bells is the biggest and the best bridal show in Peterborough and the Kawarthas. Over 100 local exhibitors participating with services ranging from hair and makeup to real estate. Couples can literally plan their entire wedding at the Wedding bells bridal show. Last year the show was a big success, with over 2800 people attending. As a finishing touch there will be a spectacular fashion show presented by Faye’s Designer Bridal at 3:00pm. 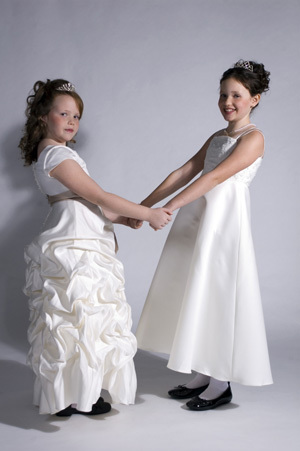 Exclusive gowns from the Spring 2009 collections will be showcased as well as the latest fashions in trendy bridesmaids. Lingerie fashions from The Bra Boutique and suits and tuxedos from The Gentry will also be highlights of the show. For the first time, Faye’s Designer Bridal will be hosting a wedding gown sale at the Memorial Centre before the fashion show begins. Many gowns to choose from and all sizes will be available to purchase. Gowns will range from $99 to $800 and are on a first come first served basis. The staff at Faye’s encourages brides to shop early for the best selections that will be at the show. This year we are drawing for 7 major prizes for your wedding day. A wedding gown, an all inclusive Carnival cruise, a tuxedo package and spa services are just a few to mention. Every exhibitor will have their own draw prize, that’s over 100 chances to win. Advanced tickets are available at Faye’s Designer Bridal and at the memorial centre. Tickets are a great stocking stuffer idea. Cost is $10 each ticket and free parking available at the centre. Everyone is welcome! Brides….bring the groom, your bridesmaids, your parents, make a day of it. There is something for everyone participating in your wedding. Come see us at the Memorial Centre, Sunday January 4th, doors open at 11:30 am. I would be very interested in finding out more about the Wedding Bells Bridal Show and it’s location. Would you know if there are any stands available as I will be working for a Wedding venue stylist from December and would love to exhibit with you. I was hoping to sign up as a vendor for this show in Jan. I have been having a hard time finding out who I should be contacting for this. Let me know. We were also hoping to sign up as a vendor for this show in Jan. We have been searching to try and find out how to register for this event and are having a very hard time doing so. We are just wondering who we should contact in order to register as a vendor for Wedding Bells 2009. If you could let us know that would be greatly appreciated. I would like a vendor’s booth at your show. Please reply with any information.